The 1st Conference of Grassroots Activities for Reviving Buddhism in Japanese Society was held on October 5, 2010 at the Tokyo Grand Hotel under the sponsorship of the Zenseikyo Foundation & Buddhist Council for Youth and Child Edification and the Rinbutsuken Institute for Socially Engaged Buddhism. In the Japanese Buddhist world, there had never before been such an event to assemble Buddhist priests and general Buddhists engaged in activities for society from all over the country representing a variety of denominations to present their work and exchange their views. There could be seen a great interest in the presentations of these ongoing activities among the 150 participants who assembled from all over the country. In his opening remarks to the conference, the Chairman of the Zenseikyo Foundation and Head of the Rinbutsuken Institute, Rev. Akitoshi Saito, remarked that, ?At this time, such a great gathering of people represent the future promise of the Japanese Buddhist world.? Keynote Speaker Rev. 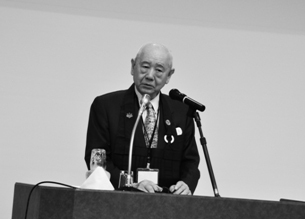 Yasuaki Nara, Professor Emeritus of the Soto Zen affiliated Komazawa University and Board Member of the Rinbutsuken Institute, opened the conference by speaking on the theme, ?Towards Restoring an Interconnected Society.? He began by reading a quote from the suspect in the stabbing rampage which took 7 lives in the Akihabara electronics district of Tokyo in June 2008. The suspect was quoted as saying, ?In the real world, you can?t find anyone to talk about something that?s bothering you. So I have run away from the real world and entered the world of the internet. I just wanted someone who would pay attention to me.? Rev. Nara used this quote to highlight how present day Japanese society has become so disconnected. Rev. Nara then explained that among young people who come to his temple, there are those who rarely talk with others about their personal matters. If you ask them why, it seems they think that they will be harassed if they express their feelings or opinions and so it?s better to stay quiet. However, those kinds of people who do not want to be associated with anyone or be a bother subconsciously still want to be paid attention to by someone. This is the reason they have ended up entering the internet world. Rev. Nara then used the metaphor of Indra?s Net from the Brahmajala Sutra in which Indra covers the world in a net in which every node is a human being. The sutra says, ?Everything is interconnected,? and so ?the gathering together of individuals is not the sum total. The sum total is the interconnecting of individuals.? Rev. Nara noted that recently there is a new term that has been coined in Japan called tomokizu, which means something like, ?mutual establishment.? This means, in terms of humans, that while many cells may be collected together, they are totally useless if they each work as individual units. However, if they all come together to work, they can continue onward through the establishment of wholeness. From the view of Indra?s Net as well as the view of ?Mutual Establishment,? contemporary Japanese society is very much disjointed and disconnected. Rev. Nara expressed that in order to restore an interconnected society, it is very important to have a warm concern for others. He noted that the words of Mother Teresa, who said, ?The opposite of love is not hate but rather indifference,? made a profound impression on him. In Buddhist terms, these words mean turning love into compassion. Although we may not be able tp do anything to help these people in trouble, just sharing in their suffering together will help to make the world a considerably easier place to live. The thing that is needed from people today is ?to have concern for others? and ?to get involved.? This is the practice of compassion. Rev. Nara concluded that, ?Today, I would like to advocate ?a grassroots movement of Buddhists who get involved?. The recently deceased teacher, Taido Matsubara said, ?Alone, one person can do nothing, but if this one person does not start something, then nothing can happen.? In this way, person by person, getting involved at the grassroots level, we can begin to change this society.? Rev. Ryokan Misono?Toko-in temple, Tendai?gave a presentation on his experiential farming activities connected to his temple called “The Buddha’s Veggie Garden.” About 80 people, mostly temple members, participate in this project from a broad range of ages from kindergarteners and elementary school students to junior and senior high students as well as the elderly. The participants plant and cultivate throughout the year various crops, such as buckwheat, potatoes, onions, etc. Through working together doing farm work, divisions between generations are transcended and a caring mind is developed among the young and elderly alike. Rev. Tomoaki Eda (Institute of Comprehensive Buddhist Studies) gave a presentation on Project Dana Tokyo. This project is run mainly by 11 priests from the Jodo Shin Hongan-ji Pure Land denomination to provide volunteer priests who provide companionship to the elderly living in social welfare facilities located near temples. First, Project Dana receives communication from priests in an area who “want to offer companionship and deep listening as a volunteer.” After locating a facility for them to visit, they go once a month to offer concentrated companionship to the elderly. At the beginning of this work, some of the directors of these facilities as well as the elderly themselves had doubts about visits from Buddhist priests, but now that they have come to understand their work, they are being requested to come visit other facilities as well. Rev. 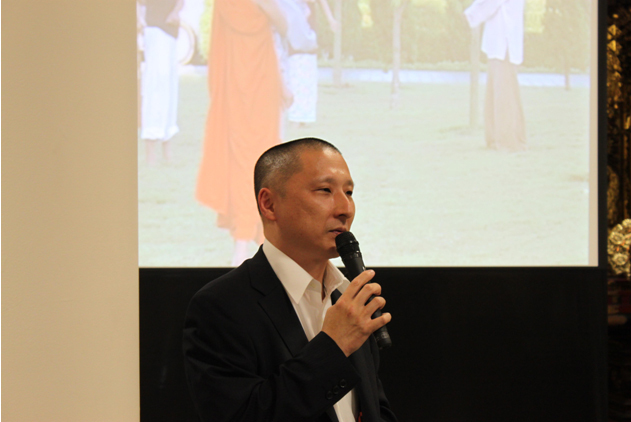 Noda Daito (Soto Zen) of Hoshi-on temple gave a presentation on “The Effectiveness of a Temple-based Big Family”. At his mountain temple, Rev. Noda has received young “shut-ins” (hikikomori), those who have remained in their rooms for years unable to face society (a total of over one million exist in Japan). He has also set up a special school on the temple grounds for juvenile delinquents and children with learning disabilities. Much of his rehabilitation work is based on exposing these young people to the simple and mindful Zen lifestyle of meditation, chanting, preparing meals, farming, and living close to nature. He is now expanding this work by building an elderly home in which these abandoned young people will help care for the abandoned elderly. Rev. Sojun Wada?Myokyu-ji Jodo Shin Hongan-ji Pure Land?gave a presentation on Buddhist Education through Shadow Play. Rev. Wada has developed shadow play as the chair of a theatre troupe called “The Fresh Sprouts of Shadow Play.” He says that, “Shadow play must take place in the dark at night, and this makes it easy to create a religious atmosphere. Doing it at the temple is also perfect” for making a great shadow play. Rev. Kakuho Aoe (Jodo Shin Pure Land) of the Interdenominational Buddhist Association (IBA) gave a presentation on “Developing New Approaches.” IBA uses its Higan-ji (“other shore”) virtual temple homepage as the main pillar of its activities where it presents a variety of information on Buddhist themes. However, it also goes beyond the net to organize a wide variety of activities connected to Buddhist temples, such as concerts and creating open spaces at temples for peaceful leisure time. Rev. Gakugen Yoshimizu (Jodo Pure Land) of the One Spoonful Association gave a presentation on “Becoming Intimate with the Situation of Needy People”. Rev. 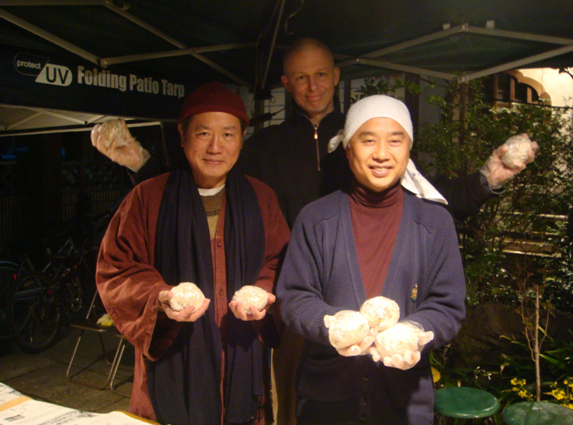 Yoshimizu is one of the leaders of the One Spoonful Association comprised of mostly young Jodo Pure Land priests and lay volunteers who gather twice a month to wander their neighborhood streets in Tokyo to bring food and medicine to the growing number of homeless people. More than simply charity work, these activities have conscientized both the priests and the volunteer participants to become more comprehensively involved in the deepening suffering from economic decline in Japan, especially the high rate of suicide and the increasing need for health care and other forms of welfare for the poor. After the three separate sessions of presentations finished, there was a final plenary with summaries of the sessions. Rinbutsuken Institute research fellow Rev. Wakei Ishigama noted that, ?It is not impossible that the original activities of the temple and these new kinds of activities cannot be joined together. I think this is the secret to their future continuation.? Rev. Jin Hitoshi, the Director of Zenseikyo who organized and presided over the conference, remarked that, ?Rev. Nara in his keynote speech spoke of ?a grassroots movement of Buddhists who get involved?, and today we have seen such Buddhists who are getting involved. Gathering these individuals together, we can make single points in a line, and this line can then become a front. In this way, I feel optimistic that in due course social change will be brought about.? In the concluding address, Rev. 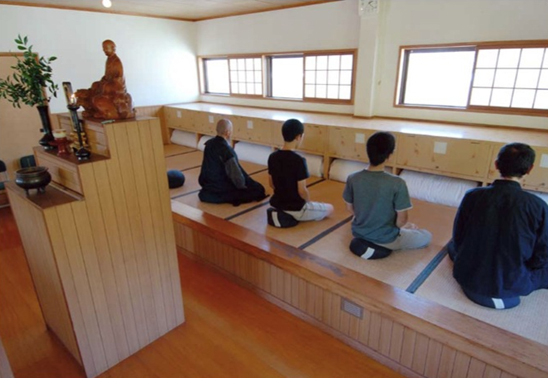 Hoyo Watanabe, Professor Emeritus of Nichiren affiliated Rissho University and Board Member of the Rinbutsuken Institute, tied things up by stating that, ?We can no longer be patient with just the usual activities of the temple. There are many priests who are reviving Buddhism?s role in society and this makes me quite pleased. ?